Must have elegant and timeless dress! 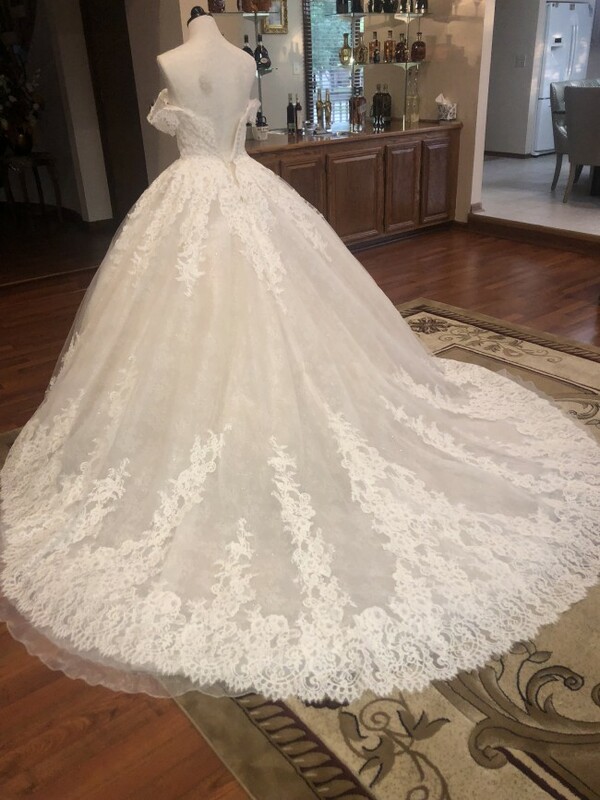 Dress includes hoop that is currently detached but can easily be sewn back in if bride prefers the bigger ball gown look (hoop was added in my dress as shown in pictures). Veil was custom made to match the dress, and will be given at no additional cost. It is a 2 tier veil that falls to fingertip length and has a blusher included. Back of dress has three bustles to secure the train when needed. Dress in great condition and is dry cleaned! The dress is mid-low back. In the pictures listed with the dress on the mannequin, the zipper was left open because it was unable to zip all the way up. If there are any further questions or more pictures are requested, please feel free to reach out to me! Dress is originally a size 6. Bust size is made for a 34C and the waist was taken in to fit a size 4, which is what I usually am. If waist needs to be opened up more to fit a bigger waist size better, it can still be opened up and adjusted from the inside seams.